Ellis Music Company - Christmas Quartets for All - Trumpet or Baritone T.C. 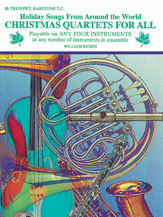 Music and Method Books > Duets and Ensembles > Christmas Quartets for All - Trumpet or Baritone T.C. Christmas Quartets for All - Trumpet or Baritone T.C. This collection of 15 holiday songs, carols, and instrumental pieces can be played together in harmony by any number or combination of instruments. Woodwinds, brass, strings, and mallet percussion can have fun playing in like instrument ensembles and get creative with any mixed ensemble. They are also outstanding tools for auditions, sight reading, and learning the art of ensemble playing.